Another exciting project by DARLING PUBLICATIONS, now in co-operation with the Danish High-End Digital Back manufacturer PHASE ONE and still life photographer Søren Jonesen from Copenhagen. The object of desire is this time not the design of Bang & Olufsen or silver ware by Jensen, but an unpublished Stradivarius violin of an excellent vintage: 1714! Both Yehudi Menuhin (ex-Soil) and Jascha Heifetz (Delphin) played on violins by Stradivari of this year. The results of the photo shooting with the very first production unit of the 80 Megapixel (!!!) IQ 280 Digital Back on the Arca Swiss Monolith technical camera (6 x 9), the Schneider-Kreuznach 120 mm macro Apo Digitar (specially designed for Ultra High-resolution digital backs) and most importantly, the very best and sensitive light setting from a worldclass professional still life photographer, will show for the first time ever an adequate 3-dimensional reception of the sculptural qualities of the great Antonio Stradivari. Former efforts from respected photographer colleagues are certainly made with ambition and noticed with appreciation, but we cannot deny the fact that those images are outdated by a new standard set by Søren Jonesen. We are sure that discerning eyes will see the differences immediately, as the first sneak-preview presentation of the images at the Cuvée Darling 2013 Palazzo Trecchi Exhibition in Cremona earned unanimously the opinion (with actually no exception…) that this quality surpassed all what has been shown till today. At Darling Publications we understand full size as FULL size, that means: no chopped off scroll, printed on another page, but like in the real thing and in real life we prefer the head to stay on the belonging shoulders, don´t we? 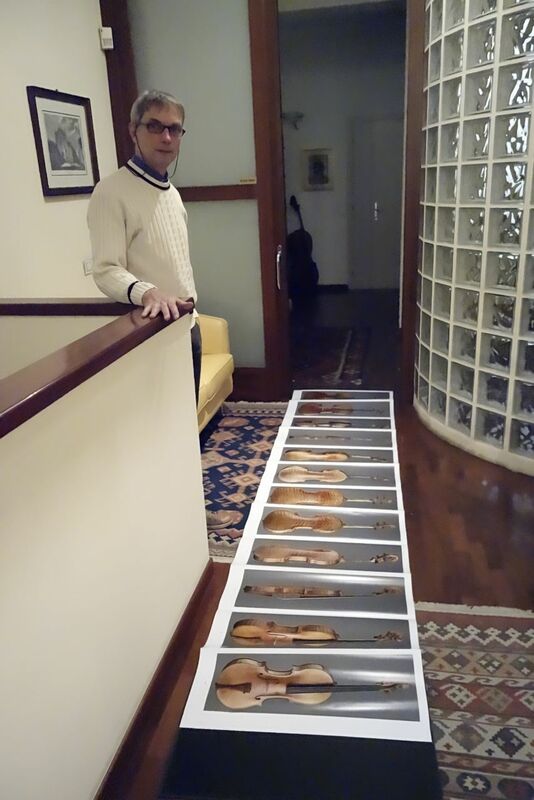 Bernhard Neumann, Cremona is shown a prototype of this upcoming book, where a violin is shown for the first time in full size.